For all the headaches and adjustments that come with moving to a new place and culture there are always positive amazing reasons why you do it. While some of these things are big events, others are just in the day to day. Tonight was one of those little moments that makes travel and living abroad fantastic, in my opinion. I just finished a batch of Borsch (beet soup) in prep for Ukrainian Christmas this weekend. Though I won’t be trying to host a big feast or anything this go around, I just wanted to make a taste of things. As I know he often works late, I thought I’d check if my friend, Rasheed, wanted to swing by for a bowl. 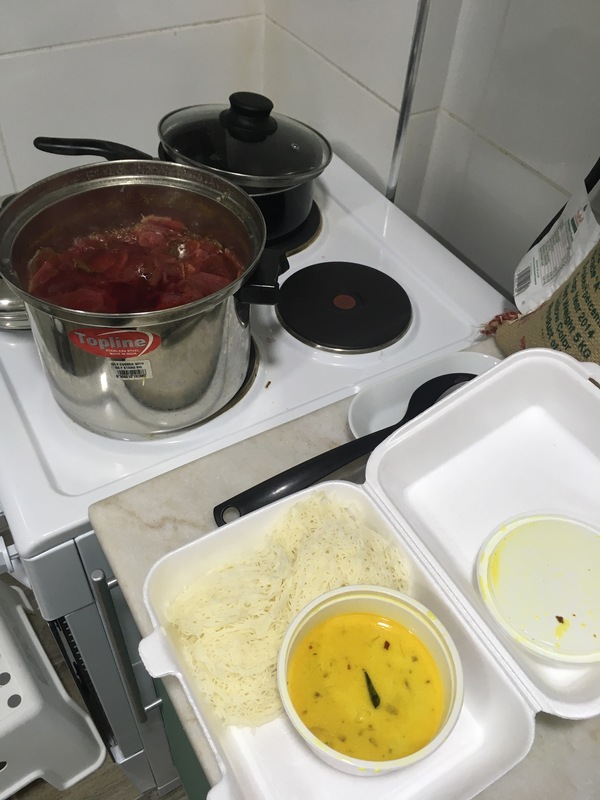 He showed up for his doggie bag with a delivery of my own…And so tonight we exchanged Ukrainian borsch for southern Indian idiyappam. In the simplest of gestures this moment summed up the holidays abroad for me and put a smile on my face. Khrystos Razdayetsya!